Remember your first date? When you were preparing to go you probably heard your mother encourage you to look your best and be presentable. You know the saying, “You never get a second chance to make a first impression”. Not only is this applicable to dates but also when interviewing for a job. It’s equally important though when it comes to your website. According to Jakob Nielsen, most visitors leave your webpage after only 10-20 seconds. Ironically, that’s just about how long it took for you to read this paragraph. Catching your users attention and giving them something worth staying for is extremely important. Once your page loads, users form an opinion in .05 seconds. — Kinesis Inc.
Is your website sending the right impression during those precious, first few seconds? Are they staying around long enough to learn who you are, what products and services you offer? Are they able to understand your unique selling proposition?Is your site past its expiration date? Is it collecting dust or is it working for you? Here are seven (7) reasons that your website is in need of a redesign. I’m sure that we have all browsed a website that isn’t mobile-friendly and can relate to how frustrating that experience is. Yet even with the knowledge of this, and likely with the personal experience, many companies and websites still have a website that is not optimized for their mobile users. Knowing these statistics is eye-opening and completely changes the website game. With such a large percentage of users browsing and searching via mobile it is imperative that your site is optimized for mobile use. The first impression that a potential customer or client gets of your brand will very likely be from a mobile device. And as we all probably learned from dating or interviewing, first impressions can make or break a relationship. You should desire to deliver the best experience to your users, no matter what device they are using. An incredible, smart website with an awesome mobile experience is crucial to the overall success of your website. If mobile isn’t as strong as it should be on your website, that’s a clear indication that your website is in need of a redesign. According to a Web Usability report by KoMarketing, “After reaching a company’s website via a referral site, 50% of visitors will use the navigation bar to orient themselvelves” and ”…36% of visitors will click on the company’s logo to reach the homepage”. Your site’s visitors are definitely interested in knowing where they are on your website and where to go next. To say your website navigation isn’t important is a vast understatement. Your navigation is essentially a lifeline for your users and is a key grounding element for them. If your website is not optimized or provides a poorly designed user experience then you could be confusing your users and leading to them abandoning your site. If your users are experiencing a poorly designed user experience on your website there are some things that can be done to fix some common navigation mistakes (as indicated in this Kissmetrics article) such as utilizing difficult to use dropdown menus or disappearing or hidden navigation. There are some great solutions that you can use to avoid these type of mistakes and to ensure that your user always has access to your homepage and other important links – such as incorporating a “sticky” navigation so that it is always present even when a user scrolls to the end of a tl;dr article. 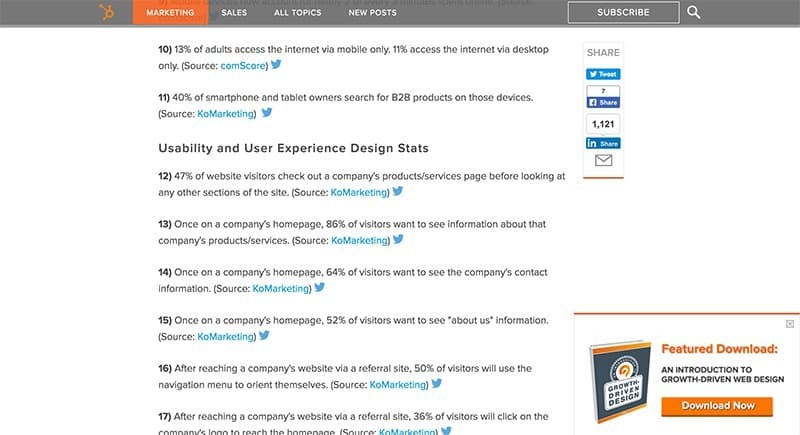 Check out a good example from Hubspot of this type of naviagation below (or even on this page at the top of the page). Older sites may not be optimized with this type of header or navigation so could be in need of a small redesign or update which can lead to great benefits. A great way to gather insights and determine how your users are interacting with your header and navigation is to use heat-mapping software or even just by talking to some of your trusted users and happiest customers to solicit candid feedback on how hard or easy your website is to navigate. Keeping your content up-to-date is a no-brainer but surprisingly it is very often overlooked by many businesses and organizations. Many businesses do not treat their site like a living, organic extension of their company (a 24/7 employee), and forget about keeping their site fresh. We’ve all visited sites that have the dreaded “Coming Soon” message on their single blog post or on one of their site pages. It’s important to have a content strategy and editorial calendar in place to be sure that your website is setup for growth and optimal performance. As they say – Content is King – are you treating your site’s content like royalty? Is your site active or is it like an abandoned building? When was the last time you updated your blog? Having a site that is not updated is a sign that you’re not paying attention and if you’re not, then why should your audience? A very prevalent problem with many sites that show they are in need of a redesign is painfully long load times. We’ve all endured the frustration of landing on a site that loads very slowly. Instead of seeing relavant content we are confronted with a blank white page and a loading icon. The majority of users will hit the back button right away or navigate to a different site (probably your competitor!). Google even takes load times and bounce rates (people leaving your site – see below) into consideration when ranking your website so long load times can lead to poor search results and a negative impact on your users. Wow! That means that if your website’s load time is above 3 seconds, only 60% of your users will see what you offer and 40% will be gone. Is that worth it to your business to only target 60% of your potential customers? So what makes a page load slowly? There are a variety of reasons from extremely large images, slow scripts making too many external calls or even just having your site hosted on a non-optimized server environment. Some of these issues can be fixed quickly on your own if you know what you’re doing and have the time, but if you don’t you many need a website care plan to be sure your site is operating at its optimum performance level. However, if your site is old and out-of-date or is on an antiquated CMS or hosting platform you may be in need of a website redesign to be sure you are giving your users the best experience leading to good results for your company. If someone visits your site and did not interact with a single page element, then according to Google’s definition, then they are considered a bounce and increase your site’s bounce rate. So even if they arrived at your homepage, scrolled down for a few seconds but then left, they are a bounce. Bounce Rates can be a tricky thing to undertand and take some astute analysis to truly see what’s going on. For example, if you receive a bunch of traffic to your contact page but they are not doing anything on that page aside from getting your phone number and then leaving you will likely have a high bounce rate for that page which is a false indicator of a problem since the user is getting exactly what they were looking for. You will definitely want to fine tune pages like this to be sure you reduce your rates as much as possible so your users are staying on your site and really interacting with and digesting your content. There are some great ways to peak into the mind of your user and pull back the curtain to see where and why people are leaving your page. If the content or design of the page is actually the issue you could try to implement heatmap software such as CrazyEgg or Lucky Orange to reveal the user’s behavior. If you determine that your bounce rates are too high, then that could be a good indicator that your website needs a redesign or content overhaul to be sure that your users are staying on and interacting with your page. The most common reason that people seek a website redesign is typically because it is visually out-of-date or isn’t a good reflection of your brand or company. We know that many people judge a book by its cover (remember the first date?). If your website looks out-of-date, is not maintained, doesn’t match your brand look from other materials or otherwise just doesn’t look good then it will not endure your users and build trust with them. According to Adobe, “38% of people will stop engaging with a website if the content/layout is unattractive”. That’s a large number of people that will leave your site – regardless of what you offer or how good you are – simply because your site does not look good. Worse than that, a UK study shows that “70 per cent of people claim they would not buy from a company with a badly designed website”. That is a large amount of people that wouldn’t even give your site a chance purely based on how it looks. Don’t let a bad or outdated website affect the bottomline for your business. Make sure that your site design is matching how amazing your company is with a site redesign. It’s pretty clear that users today want to connect with companies in more ways than before. Social media is one area that this is true and becoming a more and more prevalent and expected extension of your brand. In fact, internet users have an average of 5.54 social media accounts and this number has risen by 176 million in the last year alone! If your website is not providing a way to nurture an online relationship with these users through social media by offering quick social sharing options, you’re not only further dating your website, but you’re also missing out on an important opportunity to interact with your customers. Worse than that, you aren’t making it easy for them to share your content if they do find it compelling. Did any of these items describe your website? Is your site guilty of even one of these things? If so, it’s very clear that you need a website redesign. By the way, these aren’t the only reasons why your site may need a redesign but if your site does have any of these tell-tale issues, you should connect with us to determine if you are in need of a full website redesign, some small changes or if you are good as you are. Still not sure? Let’s talk! I would be happy to help you figure things out and get started down the right path for success.